(these are not the kids. Photo source...unknown). 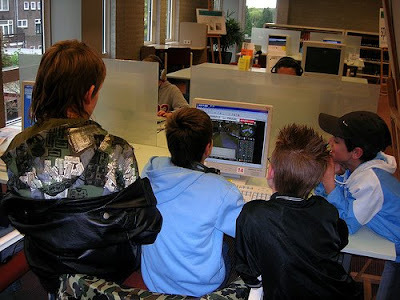 Two Dutch kids were convicted of "virtual theft" recently. It kind of got overshadowed by a more eye catching headline _ a case out of Japan where a woman was arrested for "virtual murder." The Japanese woman hacked a computer to delete her virtual husband's character in an online game, so hers was ultimately a hacking case. The Dutch kids were found to have stolen virtual goods. In my view it probably should have been robbery of virtual goods. But in any case, I do believe this is a landmark ruling so, my public service for the day is to translate some significant parts. For someone who may stumble onto this at some point in the future. A Dutch court has convicted two youths of theft for stealing virtual items in a computer game and sentenced them to community service. Only a handful of such cases have been heard in the world, and they have reached varying conclusions about the legal status of "virtual goods." The Leeuwarden District Court says the culprits, 15 and 14 years old, coerced a 13-year-old boy into transferring a "virtual amulet and a virtual mask" from the online adventure game RuneScape to their game accounts. Translation of the bulk of the ruling text after the MORE. Published Oct. 21, District Court of Groningen. "Denies all the accusations vehemently. He says that he didn't use any violence himself, and didn't see that his co-defendant used the violence he is accused of. The violence and the threats that the accuser says were undertaken by X, are completely at odds with the image that emerges from the report by the Council for Child Protection. It's actually inconceivable that someone like X, as he is described by his references, would suddenly demonstrate such violent behavior." "The Prosecutor has, in short, at the hearing, maintained that the virtual amulet and virtual mask are goods as intended in article 310 of the Criminal Code. The defense has argued the opposite. In the present case there can be said to be virtual goods, namely a virtual amulet and a virtual mask from the computer game "RuneScape." The court knows the following of "RuneScape." 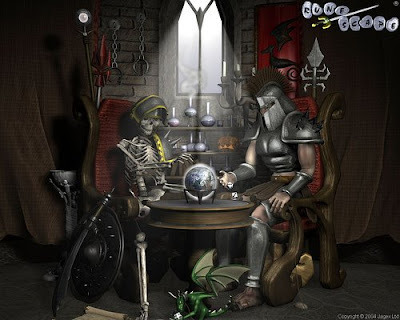 RuneScape is one of the larger online games and primarily popular among youth. Millions of players, so-called online gamers, play the game around the world. RuneScape takes place in a virtual world, in which players with characters can take part in that virtual world. Players can, among other things, fulfil quests, fight against other players and develop other activities. To do this, people can obtain among other things 'items' such as a mask or an amulet. The items have each an own value. This value is expressed in 'coins' and that value fluctuates on the basis of supply and demand for the items. With these 'coins' a person can as player, develop 'skills.' The more 'coins' the player has, the stronger he becomes in the RuneScape game. The accuser, suspect and co-defendant each had an account that gave access to playing RuneScape and were also active players of the game. The accuser had in his account a virtual amulet and virtual mask. Article 310 of the Criminal Code is intended to protect the assets of citizens. In answering the question of whether virtual goods are goods in the sense of that article, this has to be kept in mind. There are a number of criteria that must be satisfied, if something is to be considered a good in the sense of the article. First of all, it is of importance whether a good has a value to the possessor. This value does not have to be capable of being expressed in money. In current society, virtual goods from the online computer game "RuneScape" have become objects of great significance. For a large number of online gamers, these goods have value. The more virtual goods a player has, the stronger he is in the game. Additionally, the virtual goods are bought and sold for money, for example, via Internet or in the schoolyard. In the current case it appears that the mask and the amulet had value for both the accuser and the defendants. Of importance, too, is that a good need not be material. In jurisprudence, it has been determined that also immaterial objects _ such as electricity and bank account money _ have been recorded as goods in a legal sense. The virtual amulet and the virtual mask in the current case are not material goods, although they can be measured. Given the intended jurisprudence this is no reason not to consider them goods as intended in Article 310. Continuing, it appears from the jurisprudence that an important charactaristic of a good in a legal sense is that he who takes in a theft obtains actual power over the stolen good, and he who is robbed loses it. The possession of the good must pass from the one to the other. The virtual goods intended in the current case, namely a virtual amulet and a virtual mask, were in the possession of the accuser. Only he had the actual power over those goods. The possession of the virtual goods can be transferred, for instance by placing the goods from one account to another. In the current case, the goods were transferred, namely out of the actual power of the accuser and to those of the defendant and codefendant. Defendant and codefendant transferred the goods from the account of the accuser to the account of the defendant. Thusly the accuser lost the actual power over the goods and the defendant and the codefendant got the actual power. Given the virtual amulet and the virtual mask as intended in the current case satisfy the criteria, the court is of the opinion that these virtual goods fall under the concept of 'good' as intended in article 310 of the Criminal Code and belonged to accuser. 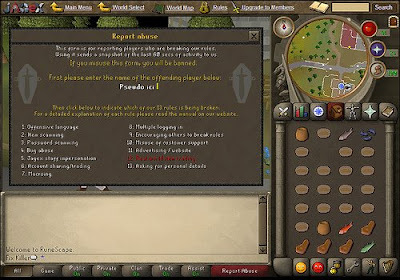 The defense argued at trial that the accused did not illegally take the goods and he should be acquitted...given the playing rules of "RuneScape" allow the behaviors of the defendant and codefendant, and they didn't do anything punishable in any case. The court is of the judgment that this argument must be rejected, given the actions of the defendant and codefendant took place far outside the context of the game, and thus can have nothing to do with the playing rules of "RuneScape." "On Sept. 6, 2007, *codefendant*, victim and me went to the condefendant's house in Leeuwarden. We all play the ongame line "RuneScape." A day earlier, codefendant and I had agreed via MSN chat to transfer virtual goods from victims account to our account. I saw that codefendant hit victim. I also saw that codefendant took a knife and went in the direction of victim. On Sept 6, 2007, I put victim in a choke hold by clamping his neck in my elbow. I flexed my muscles so that victim couldn't get any air. We hit victim. I hit victim intententionally with the palm of my hand in his face. Because victim didn't cooperate, I choked him. We forced victim to log onto that computer. Victim didn't want to give his password and log in to play the game. Because we threatened him, he finally did log in and got the game. I threatened him that he had to cooperate. If victim didn't want to cooperate, then I'd give him some more blows ... I took two knives from the kitchen drawer. I rubbed the blades against each other....to make him scared. I've been playing a game on the Internet for years now. I spend an average of four hours a day on it. It's called RuneScape. It's a game in which you are a small puppet that can earn money by working. I'm very rich on RuneScape and because I'm rich I'm also very strong. I'm almost unbeatable in this game. Because of my great wealth in RuneScape in money and possessions, I change my password almost every three days, because I'm worried someone will figure it out and hack me. I biked on Sept. 6, 207 with defendant and codefendant to the home of codefendant in Leeuwarden...I had to cooperate to transfer the money and goods from my account to the account of defendant. When I said I didn't want to, defendant and codefendant began to hit and kick me. I was apparently hit in the head with fists. They punched me on purpose and very hard against my head and ribs. Because of the beating I got, I fell to the ground of the bedroom. Next I saw that both were kicking my chest and legs, on purpase and hard. I also saw and felt that they stood on my chest, apparently on purpose and with force...I felt a lot of pain. I heard that they called to me that they would kill me. Next I saw and heard that first the codefendant went to the kitchen and got a knife and shortly after that defendant also went to the kitchen and got two knives. With the knives they threatened me with death. I became very scared. I couldn't do anything else but cooperate with defendant and codefendant. I didn't dare to refuse...I had to go with both to a computer in the living room of the flat where I had to log in with my account on the game RuneScape...suddenly I was pulled over backwards in the chair by defendant. I lay on the ground and defendant kicked and hit me again on my head and body. When it stopped, I saw that defendant sat on the stool. I stood up and saw that defendant transferred all my money and goods from my RuneScape account to his own account _ stole from me...Then both put me out of the house. Primarily theft, preceded and accompanied by violence and threats of violence, committed with the intent to prepare the theft and make it easy. The suspect has given no hint of understanding the wrongness of his behavior and has a too positive image of himself. The circumstance that he's never had contact with police before and much time has passed since the committing of the act and the trial is mitigating. The Council for Child Protection has issued two reports over the defendant, from which emerges that at school and at home there are no problems with the defendant's functioning. The Council does not give any punishment advice, since the defendant has taken a position of denial. Jailtime doesn't make sense for a defendant who was 14 when the crimes were committed. Yada yada yada. Sentences of 200 community service hours and 160 hours, and a suspended 2 month sentence for each. This decision is signed by B.J. de Jong, chairman and child judge. MJ Dijkstra and A. de Jong, rechters. Verdict rendered at open sitting of this court on Oct. 21, 2008.